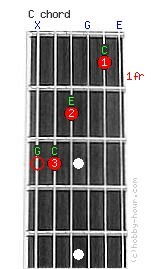 Chord C notes: (G), C, E, G, C and E.
The note G on the sixth string is not required, but can be played on the 3rd fret if needed. The guitar strings 3(G) and 1(E) are left open. C major chord's alternative names: CM, Cmaj, Do major, C dur.